These guided daily tours are less technical than our Singletrack Tour selection, and are suitable for all. Tours are on a mix of sandy dirt tracks and quiet, asphalted back roads. Tours include professional guide, lunch and bike / helmet hire. Best for: Discovering the region’s most beautiful landscapes and chruches with minimum effort! Includes: transfer to and from your hotel, professional guide, bike and helmet hire, restaurant lunch and emergency assistance. 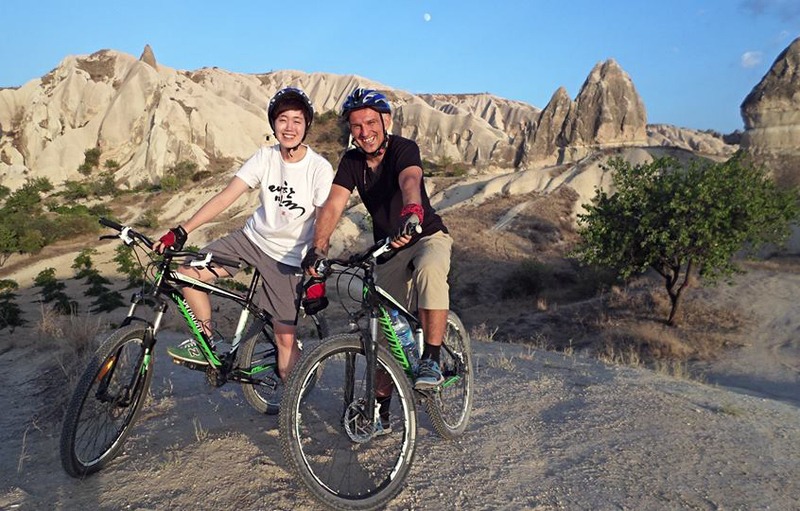 This relatively easy 22km ride is designed to allow you to experience Cappadocia’s most beautiful sights by mountain bike. It is challenging in places, and there are some sections where you may need to push the bike. Your guide will offer full instruction, and you will gently and securely tackle the route at your own speed over the course of the day. Starting at the Middle Earth Travel office in Goreme, we begin with a gentle spin down through the village, soon turning up into some of the region’s most dramatic countryside. Here, nearby incredible “fairy chimney” rock towers, we have time to explore a little on foot. Your guide will explain how the geology of Cappadocia formed and its social and historical contexts. Moving on, a level and well surfaced dirt road takes us deep inside Zemi Valley- one of the greenest and most captivating places. Returning along the same track, we take a short detour uphill to visit the impressive El Nazar Chruch. From here, a fantastic undulating track passes through an unbelievable area of cave dwellings, rock cut churches and even a monastery complex, known as Swords Valley. Now climbing into Rose Valley we visit one of the most impressive churches in the Goreme area- the Church of Columns. Taking our time, we reach the small, historical village of Cavusin easily and stop for a leisurely and enjoyable 4 course meal at a highly rated restaurant. In the afternoon we begin with a visit to the 6th Century Church of St John the Baptist- one of the largest and oldest cave churches in Cappadocia. After spending some relaxing time sightseeing in Cavsuin, we head off on the bikes once more, crossing the valley plain and reaching the entrance of Love Valley (sometimes known as White Valley), where we’ll visit an area of incredibly phallic “fairy chimneys”, and possibly stop again here to explore on foot. Returning through the valley along a different path, a last challenging climb takes us to an elevated position above Goreme where you will enjoy unmatched views over to Cavusin, Rose and Red Valleys and the Boz Dagi table top mountain beyond. The end of a fantastic days ride! Lunch: House of Memories Restaurant, Uchisar- delicious open buffet of Turkish meze, soups, main course and dessert in a wonderful atmosphere. Includes: professional guide, bike and helmet hire, restaurant lunch and emergency assistance. Climbing to the summit of Uchisar Castle for the best 360 degree views of the area. Taking mountain biking detours through Swords Valley as recommended by your expert guide. 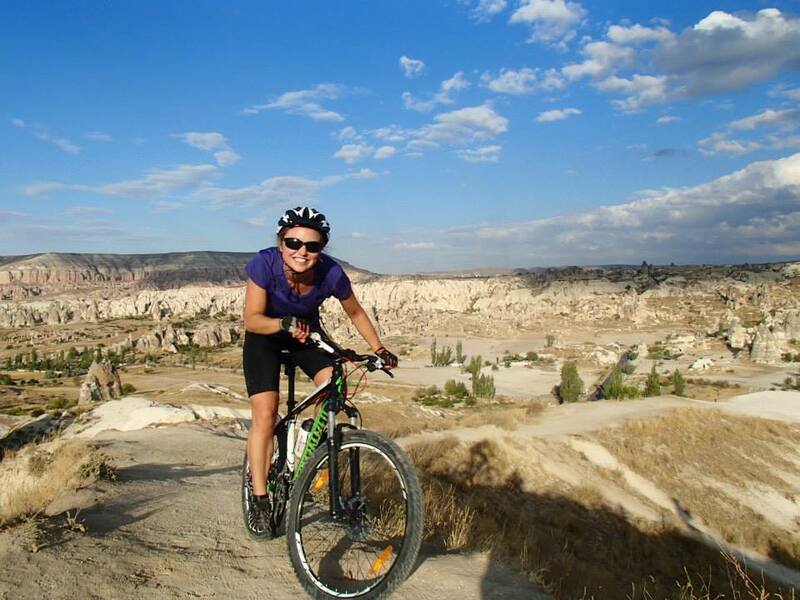 This is a circular bike tour from Goreme that takes in many of the regions most unmissable views and stunning landscape panoramas. It’s also possible to start and finish in Uchisar if you’re staying there. The tour is suitable for all, and although there are options in the afternoon to go “off track”, stays mostly on dirt roads and well surfaced paths. Starting at the Middle Earth Travel office in Goreme at 10.00, we begin a steady and fairy long climb, first up through the village itself, and then up towards Uchisar on a dirt road that affords increasingly wide views over the valley below. We pass by Pigeon Valley and stop to fotograph the incredible valley scenery there. In Uchisar we visit Uchisar Castle- a natural rock outcrop fortified to protect Christians during volatile Byzantine times. Climbing to the top of the castle takes us to the highest point in the region, and a chance to capture incredible 360 degree views. We enjoy a leisurely lunch at a characeterful restaurant overlooking Pigeon Valley, Ortahisar and on clear days all the way to Erciyes volcano in the distance. After lunch, we relax with a long, gentle downhill freewheel along the edge of Love Valley canyon- always on smooth, easy to handle tracks and never too steep. There’s an option to ride into the valley itself to explore the “fairy chamineys” in more detail- your guide will advise. Crossing the valley flats to Cavusin we visit the 6th Century Church of St John set amongst towering, crumbling cliffs. The final section back to Goreme through Swords Valley (Kilicalar) is full of interest, passing through an immense landscape of fairy chimneys, rock-cut dwellings and even a thousand year old monastery complex. Here there are options to try “single track” biking too- ask your guide. You’ll return to Goreme, from where we’ll drive you back to your hotel. Goreme Pathways is a challenging but non-technical MTB bike ride. Includes: Transfer to and from your hotel, quality bike and helmet hire, professional guide, restaurant lunch. Excludes drinks and tips. The best mountain biking on only the easier trails. 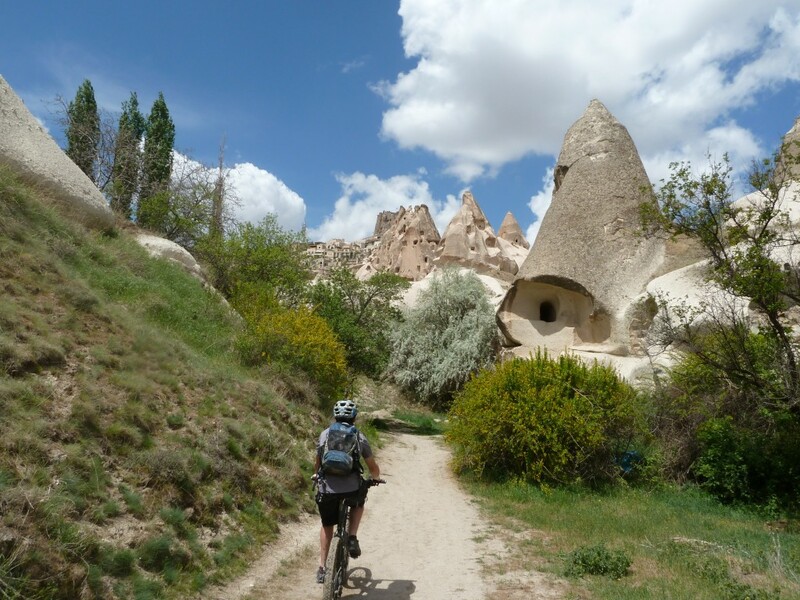 This circular ride from Goreme is a mid-level dirt road and easy singletrack tour that circumnavigates the imposing table top mountain of Boz Dagi. It is suitable for all, but nonetheless challenging. Leaving Goreme, the ride soon ascends onto a paved and then dirt road which heads north towards the small, historic village of Cavusin. Enjoying fleeting glimses down into Love Valley to the left, and Rose, Red and Kiliclar Valleys to the right, almost instantly we are enjoying the area’s very best views. Stopping in Cavusin to visit the impressive 5th century Church of St John the Baptist, we set off on a relatively flat, sandy dirt track via the incredible “fairy chimneys” of Pasabagi, to the dry, barren landscape of Devrent Valley. From here, a brief asphalt climb rewards us with an easy cruise downhill to the vibrant and youthful town of Urgup- where we enjoy a good restaurant lunch on the town square. From Urgup we take a gently climbing dirt road up a delightful, shady valley that is awash with butterflies and wildflowers in the early season. We gain height relatively easily, and without too much excertion arrive at the Panormaic Viewpoint above Red Valley- to enjoy one of the region’s most fantastic landscapes. From our high point here, we decend on smooth, ever-narrowing and eventually very steep trails that bisect a spur separating Rose and Kiliclar valleys. The final section of the tour is on singletrack paths, but even first time mountain bikers will enjoy their smooth, undulating nature as we wonders back to Goreme via the stone stacks, rock-cut pigeon lofts and age-old churches of Swords Valley (Kiliclar). The end of a fairly challenging but hugely rewarding day! Tour Information: Prices for all tours are as follows: 180 Euros per person (1 pax), 120 Euros per person (2 pax), 100 Euros per person (3 pax), 90 Euros per person (4+ pax). Prices include transfers where required, good quality bike and helmet hire, professional guide and a nice restaurant lunch. Tours begin at the Middle Earth Travel office at 09.00 and return at around 16.00. To make your booking please navigate to the bottom of this page and leave a comment. We’ll get straight back to you via email. How far is it from your office – are you able to pick us up or we need to make to your office? Hi Igor, Thanks for your message. We have availability and happy to run your tour on that day. Our guide will meet you at the hotel at 09:00am on 10th June. Our office is only 5 minutes walk away. You’ll be back between 16:00 and 17:00. I’ll send you an email so we have better contact that way. Hi, my girlfriend and I are planning a trip to Turkey and it will be awesome to bike some there!! Do u still offer these MTB guided tours during Christmas/New Year? Our idea is to do 2 or 3 routes, around 20-25km each, visiting landscapes and some of your outdoors treasures from Capadocia’s area. I’ve checked out t’he weather and It looks like It can be doable, what do u think? Hi there – do you have any availability for two cyclists (but beginner mountain bikers!) on Tuesday 27 or Wednesday 28th March? We are looking for a single day adventure! Possibly visiting Cappadocia for 2-3 days around February 17-20. There’ll be 3 of us. We’re looking for single day biking adventures and are 1 beginner and 2 intermediate bikers. Hi, We will be there on March 22 (flight arrives at 11:30am) and March 23 ( doing balloon flight in the am). It would be two people,we are fit with paved road cycling experience but no mountain biking experience. Do you have half day tours? Opening to joining a larger group. Please provide pricing and info on half day tours, and availability and info on tours.